I bought myself a cookbook (or five) for christmas. This one is called "I didn't know my slow-cooker could do that" and it's full of weird recipes that you might not normally make in a crock-pot. And a few really useful ones, as it turns out. 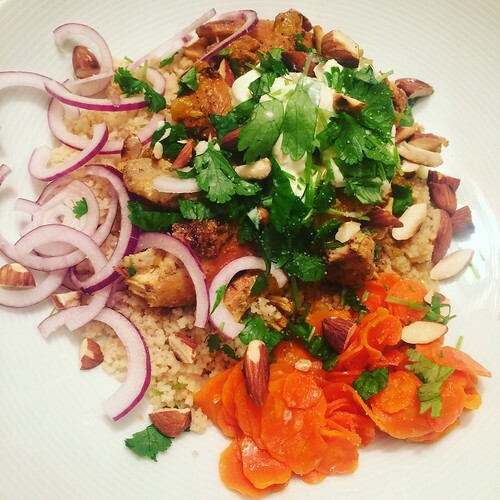 I was immediately drawn to one that was called "Moroccan Tagine-Style Chicken Thighs" and though this isn't that, it's heavily inspired by it. Start by mixing the marinade. Add this and the chicken thighs to a plastic bag, massage well to distribute the marinade and then place in the fridge over night. When you're ready for dinner, prepare all the sides and then taste the stew for seasoning. And that's all, folks!